Brilliant stop/start post-punk reps from Australia's finest sonic export since HTRK, backed with excellent remixes from like-minded metronomists Factory Floor, and Justin K Broadrick. Some canny, itchy trigger-finger editing turns the battery of delayed drums and clawed guitars on 'Wrapped Coast' into an unpredictable roil, prone to doing what the f**k it wants, while the vocals come across like the druggiest Spacemen 3 mantra, keeping us utterly rapt in the process. Factory Floor's "The Michael Cliffe House Remix" reduces it to a wrigglier, kinkier latin techno shuffle layered with slight metallic dissonance, all pensive potency precipitating a body blow kick drum. We could imagine Derrick May playing this. 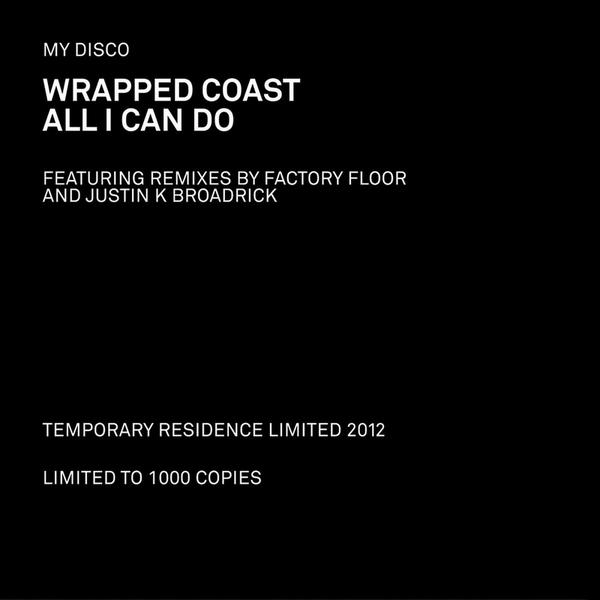 Back to My Disco, 'All I Can Do' is a moodier piece, slowly swaggering to a crotch-slung bassline through thick clouds of feedback, which Justin K Broadrick treats to a dense, steppin' 'Warmer' mix and a blown-out 'Heavier' mix. TIP!